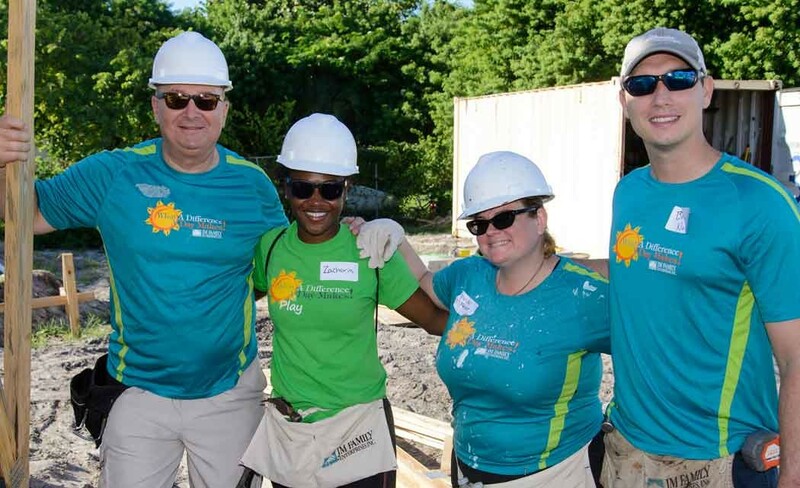 For the 14th consecutive year, JM Family Enterprises has committed to building homes for four South Florida families with Habitat for Humanity of Broward. The initial build began Saturday, Oct. 3, and includes the first ever Habitat for Humanity duplex constructed, along with two free-standing single-family homes. At the recent volunteer event, JM Family associates worked on the roofs as ground teams passed support trusses to roof teams who secured them to the house frames. Six more weekend builds will follow through spring 2016 to finish construction, roof installation, painting and landscaping. Once the Habitat houses are completed, keys will be turned over to their excited new homeowners during a dedication ceremony in May. Since partnering with Habitat in 2002, JM Family has helped construct 27 houses with more than 800 associates investing over 15,000 hours into projects throughout Broward County.